On-screen entertainment is a big part in the lives of today’s adolescents. Reasonably, queer youth deserve content that doesn’t feed into the idea that heterosexuality and being cisgender is the norm. With the long anticipated film “Love, Simon” released March 22 in theaters all across America, queer teens finally had an on-screen character to relate to. There isn’t anything blatantly wrong with “Love, Simon.” The movie adaptation of Becky Albertalli’s book “Simon vs. the Homo Sapiens Agenda” brings us to suburban Atlanta, where the protagonist, Simon, has thus far lived a quiet, normal life. He’s an initially closeted gay, Caucasian teenager at a high school that looks pretty well-funded. Throughout the movie, Simon exchanges anonymous emails under the pseudonym, “Jacques,” with another gay schoolmate who goes by “Blue.” Simon wrestles around keeping his emails from getting leaked to the school´s gossip forum and guarding his sexuality from most people in his life. Tired of the rumors and internal pressure brewing, Simon announces that he would be willing to out himself by waiting for his anonymous true love at the school carnival. There, Simon meets Bram on the Ferris wheel above the crowd of teenagers gathering around. At last, both teens reveal their true identities to each other and the world around them. The film fulfilled its promise by embodying a celebration of the LGBTQ community. However, it is critical to understand that the film is simply not enough for queer representation. “Love, Simon” shows all of us that being a closeted teen isn’t quite easy, yet the film concludes with a happy ending for Simon and his new boyfriend. While non-LGBTQ people may applaud “Love, Simon” as a heartwarming, revolutionary breakthrough in Hollywood, the LGBTQ community needs movies to roll out soon that truly reflect a broader, modern audience. Each aspect of a movie is a vessel capable of pulling society forward. Think “Super Size Me,” “Selma,” or even the beloved, pop culture gem, “Mean Girls.” However, Hollywood has watched opportunities go untaken here and there that could have helped to give the LGBTQ community a stronghold in mainstream films. Movies begin with the actors. Surprisingly, the lead actor of “Love Simon,” Nick Robinson, confirmed that he was in fact not gay in an interview on the Ellen DeGeneres Show. Although the cast was also comprised of a few queer actors, Simon’s role should have been played by a gay man. Recently, cisgender actress Scarlett Johansson withdrew from a transgender male role for the movie “Rub and Tug” due to the controversy of casting a cisgender actor into a role that should have been open to a marginalized group of talent. Denying queer roles to queer talent is a trend reminiscent to black- or yellow-facing that should be erased by reserving these roles for LGBTQ actors. 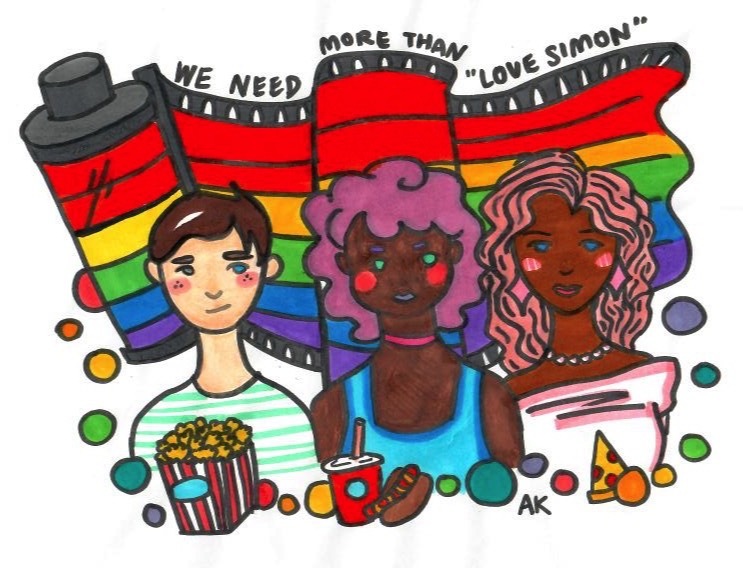 Diversity among the characters was also lacking in ¨Love Simon.¨ According to the UCLA Williams Institute LGBTStats Demographic Data Site, 39 percent of LGBTQ people in the United States are people of color. That 39 percent of LGBTQ people was not represented in the film, which fails to include a great number of people. The inclusion of different races and ethnicities in queer films would eliminate people’s ideas of how gay people are portrayed. Future LGBTQ films could explore the idea of intersectionality, which brings up economic and other societal issues in relevance to the queer community. How does being a multiracial person impact that individual’s experience navigating their gender identity or sexuality? How does living in a generally low-income neighborhood affect the cultural stigma around LGBTQ matters? All these questions could be addressed in increasingly authentic LGBTQ films, ultimately diminishing the stratification of different societal issues. In an era of “To All the Boys I’ve Ever Loved” and “Sierra Burgess is a Loser” type movies, queer teenagers should also have more mainstream light-hearted films as part of queer pop culture. There aren’t enough rom-coms with a mainly queer cast or plot. If queer films are normalized, then perhaps the negativity surrounding LGBTQ people could be eliminated . When these films show that queer people are just normal people, they could debunk stereotypes, such as the idea that being gay is a choice. So while “Love Simon” has served as a pioneer to put LGBTQ films in mainstream entertainment, there should be more films that can encompass and reflect the entirety of the community’s diversity and intersectionality.